November in Wisconsin is the commencement of the chilly season, here in Wisconsin. The leaves have made their final departure and winter coats, warm alpaca socks, wood piles, snow shovels, and our favorite comfort foods make their appearance. As the temperature continues to drop, warm and savory dishes find their way to the dinner table. Whether it is one of our Applewood Smoked Spiral-Sliced Honey Glazed Hams at the center of your holiday dinner party or a unique appetizer that sparks questions and conversation, Nueske’s has something to suit your needs. Check out some of our recipes that put a spin on classic favorites and infuses them with the perfect amount of sweet, smokiness. We’ve picked two knock-out dishes that are sure to have your guests begging you for the recipe! Sweet and savory caramel corn with bits of smoky Nueske’s bacon and hints of vanilla and cinnamon. 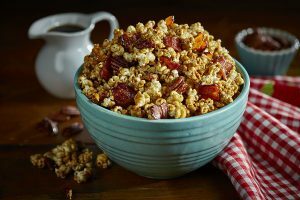 Have your popped popcorn ready to receive caramel by placing it in a large roasting pan or stockpot add the toasted pecan pieces and fried bacon on top of the popcorn and do not stir at this point. Heat oven to 265°F and have a large rimmed baking sheet lined with parchment paper set aside. In a large sauce pan, melt the butter over medium heat and once the butter is melted, stir in the brown sugar, salt, maple syrup, molasses, and vanilla. Bring the mixture up to a frothy simmer, stirring constantly, and remove from heat once you hit 250°F. Stir in the baking soda and cinnamon and quickly pour the mixture over your popcorn, stirring to incorporate. Pour the popcorn mixture out onto the parchment-lined baking sheet and place in the over for approximately 30 minutes, removing the caramel corn from the oven every 10 minutes to stir and break up any large pieces. …Check out our how-to video! Cook bacon in a large pan over medium high-heat until crisp; remove bacon and drain on paper towel, reserving drippings in pan. Add pearl onions to pan; saute 4 minutes or until beginning to brown. 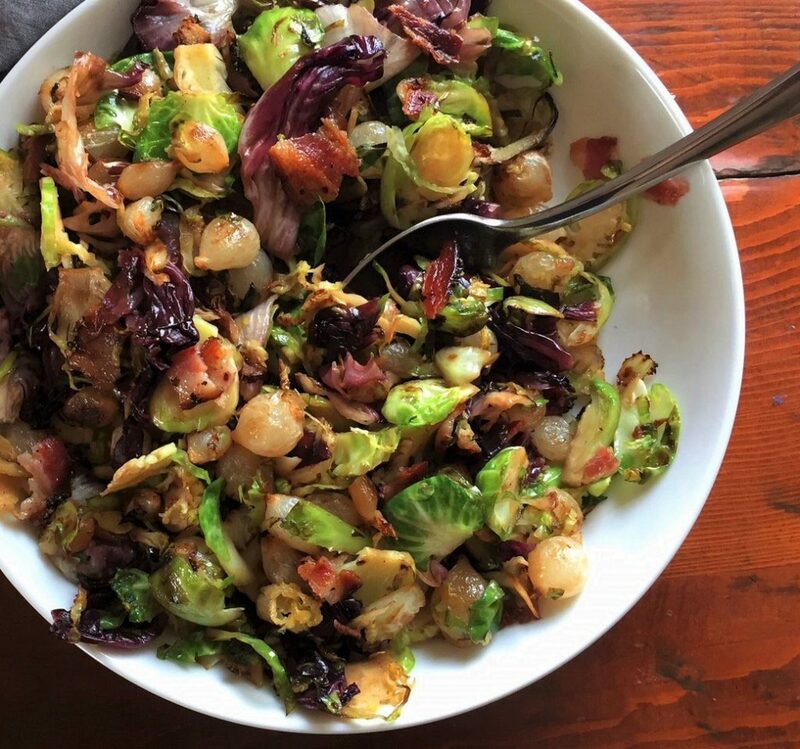 Add Brussels sprouts to pan; saute 3 minutes or until beginning to brown. Stir in radicchio; saute 2 minutes or until wilted and heated through. Remove from heat; drizzle with honey. Crumble reserved bacon and add to pan; stir well to combine. …Hope you enjoy some of our cold-weather favorites!